In this book the author and dad, James Campbell, brings trust, faith, fear, fearlessness and love in an adventure with his daughter. In this space, his daughter, Aidan boldly steps into being vulnerable in the face of difficulty and unknown circumstances. Aidan, relies on her abilities, confidence and intuition as she makes difficult decisions through their adventure in Alaskan wilderness. Not everyone can embark on such a journey through Alaska, however cultivating empowering relationships is within everyones reach. 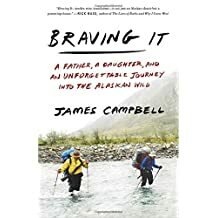 In this profoundly written book, James Campbell shows a glimpse of what its like to cultivate a wise relationship, with ourselves, each other and nature while being in an unknown place and on uneven ground.